Two millennia ago, millions of giant tortoises roamed Madagascar, an island nation off the southeastern coast of Africa that is rich in species found nowhere else on Earth. Those tortoises kept Madagascar’s unique ecosystem in check by munching on low-lying foliage, trampling vegetation and dispersing large seeds from native trees like the baobab. When humans began settling on the island about 2,300 years ago, Madagascar’s large vertebrate populations were the first casualties. Dozens of species disappeared altogether, including 17 giant lemurs, three pygmy hippopotamuses, two aardvarklike mammals, a giant fossa (a catlike carnivore), eight elephant birds, a giant crocodile and two giant tortoises. With their demise, the composition of Madagascar’s ecosystems changed, shrubs and vegetation clogged the forest floor and wildfires became more frequent and intense. Now, researchers think they’ve found a way to replace Madagascar’s lost giant tortoise species: Bring in some relatives, says Miguel Pedrono, a Madagascar-based conservation biologist with the French agricultural research center CIRAD. Pedrono’s team has identified a very close relative of the extinct giant tortoises, and they plan to transplant a few hundred of them to Madagascar to help fill the ecological gaps left by their extinct kin. Using fossils from two species of extinct Madagascan giant tortoises, Pedrono located a group of very similar giant tortoises living on the nearby Aldabra Atoll. 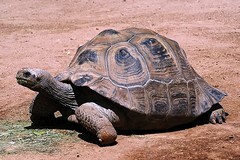 The Aldabra giant tortoise’s appearance is nearly identical to that of the extinct Madagascan tortoise, and preliminary DNA studies show they’re also very similar genetically, Pedrono said. In fact, it’s likely that ancestors of the giant tortoises living on Aldabra Atoll made the 249-mile (400 kilometers) swim from Madagascar about 100,000 years ago — the blink of an eye, evolutionarily speaking. Since the tortoises are so similar morphologically and genetically, it’s likely they’ll fill the same roles in the Madagascan ecosystem, Pedrono said. Madagascar currently has no large animals capable of swallowing and dispersing large seeds, such as those from the baobab tree. In addition, many of Madagascar’s plants have evolved defenses against large herbivores, such as spines and multiple leaf shapes that protect young sprouts from browsing tortoises. These so-called evolutionary anachronisms could disappear altogether if no species can fill the giant tortoise’s shoes, Pedrono said. To help the Aldabra giant tortoises take over for their extinct kin, Pedrono’s team plans to move 300 young tortoises to a nature reserve in western Madagascar, where they’ll live in an enclosed pen for five years. That will give researchers a chance to monitor their eating habits and other ecological interactions before the tortoises can breed and disperse across the island. The plan seems like a good one, says Elizabeth Hunter, an ecologist at the University of Georgia who has studied giant tortoise restoration on the Galapagos Islands but wasn’t involved in Pedrono’s research. Giant tortoises are good species with which to start testing these sorts of ecological replacements, Hunter said. They’re very easy to contain with fencing and easy to monitor with tracking devices, and most diseases they could carry are species-specific, meaning they likely wouldn’t infect other wildlife. Pedrono’s team plans to do thorough veterinary checks to make sure the new tortoises aren’t bringing invasive plants or exotic diseases with them to Madagascar. 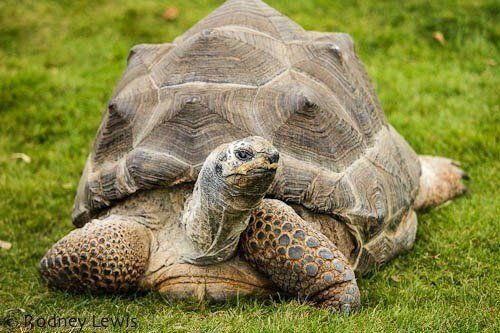 Similar plans to replace missing giant tortoises have been carried out in several locations, including Seychelles and the Mascarene Islands, and “researchers have seen very good success everywhere,” Pedrono told LiveScience’s OurAmazingPlanet. Replacement tortoises on the Mascarene Island of Rodrigues are restoring seed dispersal and grazing patterns after only seven years on the island. The giant-tortoise-replacement scheme could also be a boon for Madagascar’s ecotourism industry, Pedrono said. Original article at LiveScience’s OurAmazingPlanet. Follow OurAmazingPlanet @OAPlanet, Facebook and Google+.